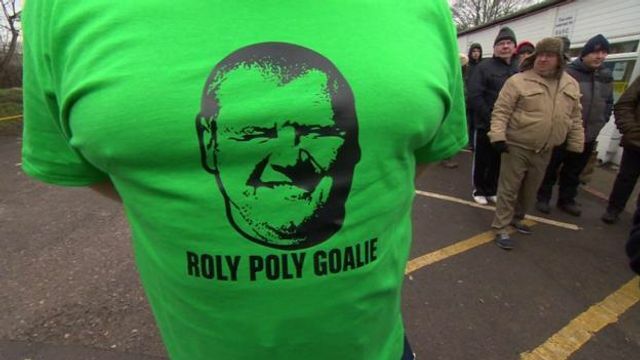 Sutton United's 23 stone reserve goal keeper - Roly Poly Goalie Wayne Shaw - is now at the heart of investigations by the FA and the Gambling Commission in respect of his choice of in-game carbohydrate. In the 82nd minute of Sutton's 0-2 defeat to Arsenal, with all substitutes having been made, Shaw tucked into a pie. Normally ill-advised during a cup game, it was especially so where Sun Bets offered odds of 8/1 that it would happen. Sun Bets is reported to have paid out a "five-figure sum" on the basis of his actions. The FA rules were not drafted with baked goods in mind. Rule 8 - Betting - broadly prohibits the individual in question betting themselves, or instructing, permitting, causing or enabling another person to do so, on any aspect of or occurrence in a football match, or imparting information relating to football. This is not quite the issue. Rule 5 - Integrity - is more widely drawn and prohibits any participant from seeking to influence for an improper purpose the result, progress, conduct or any other aspect of, or (importantly) occurrence in a match. Plainly the pasty-eating incident was well within Shaw's control, so the investigations are likely to turn on Shaw's purpose - which seems to have morphed from a gentle joke in the morning to unstoppable hunger pangs by lunchtime. Shaw appears to have confirmed that he knew about the offer and that he was not permitted to bet, but that some of "the lads" might have had a bet. The other issue will likely be whether he had any communication - directly or indirectly - which indicated his intentions to "the lads" and amounted to inside information. No public suggestion of that nature has been made. Shaw denies that he was part of any scam. It ought to have been a bit of a joke, but Shaw has resigned from Sutton, reportedly deeply upset. He may face an FA charge, financial penalty or suspension. The most serious rule breaches carry lifetime bans. The Gambling Commission has also confirmed that it is looking into Sun Bets' role in the affair. While it shows how seriously sporting integrity is taken (in line with the Commission's latest sport and sports betting integrity action plan), this is a sorry end to an otherwise fantastic run for Sutton. In the meantime Shaw has been offered a year's role as a pie-taster for a major supermarket - no-one is quite sure if that is also part of the penalty.